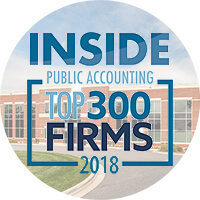 GREENSBORO, NC – DMJ & Co., PLLC has again been named a Top 300 Firm, according to INSIDE Public Accounting (IPA), a national publication serving the accounting profession. The ranking of the nation’s Top 300 public accounting firms is the only one of its kind. The September issue of the IPA ranks firms from 101 to 300 based on the gathering of information and analysis from more than 500 firms. DMJ & Co., PLLC, headquartered in Greensboro, N.C., was named to the Top 300 Firms for the fourth year in a row, ranking 261, moving up 37 spots since 2017 reflecting significant growth for the firm. Established in 1949, DMJ is a North Carolina CPA and accounting firm with offices in Greensboro, Durham, and Sanford, NC. DMJ’s philosophy―personal attention, verifiable results—is the cornerstone of the firm’s practice and client relationships often go beyond the scope of traditional accounting and auditing services. DMJ is a member of CPAmerica International and affiliated with the Crowe Horwath International alliances of firms. DMJ offers an array of services including certified public accounting, wealth management, and medical and dental practice consulting. It also provides a host of specialized services such as technology and international tax consulting, cost segregation, ERISA audits, and succession planning for privately-held businesses. The Platt Group publishes the award-winning IPA newsletter every month and the annual IPA National Benchmarking Report. The Platt Group also surveys and publishes annual reports for the accounting profession in Human Resources, Firm Administration and Information Technology.